We’re starting to see a plethora of American airlines permit the use of integrated inflight entertainment and an array of Personal Electronic Devices (PED) from gate to gate. That is, from the moment a passenger boards an aircraft until they disembark upon reaching their destination. Spoken like a true passenger. The same gentleman went on to compare cell usage inflight to the New York subway system. Really? How will PED usage affect aircraft systems? How will PED usage affect passenger control? The former is very much an unknown. Insufficient research has been conducted to adequately and definitively determine if and how wired and other untested devices might interfere with current and planned avionics and other integrated systems. The latter concern is a more significant issue for industry insiders – both in the cabin and on the flight deck. We need to be clear on one point: The drive for unrestricted PED and IFE usage does not come from any frontline operational crew. It’s very much driven by somewhat clueless airline executives that see usage as a calculated risk when compared against the commercial and competitive advantages… and of course there’s the ill-informed PED advocates that can’t go 10-minutes without watching cute cats on YouTube. Those that support usage are not motivated by a need for safety. Airlines look long and hard for a competitive edge and permitting PED use below 10’000 feet (or whatever altitude the captain determines as appropriate) is nothing more than a selling point. Of course there will be those airlines that sensibly abstain from the stupidity of it all. Be careful of those airlines that don’t. The rules pertaining to PED usage varies from state to state and operator to operator. The one constant tends to be the restricted usage of said devices below 10’000 feet. 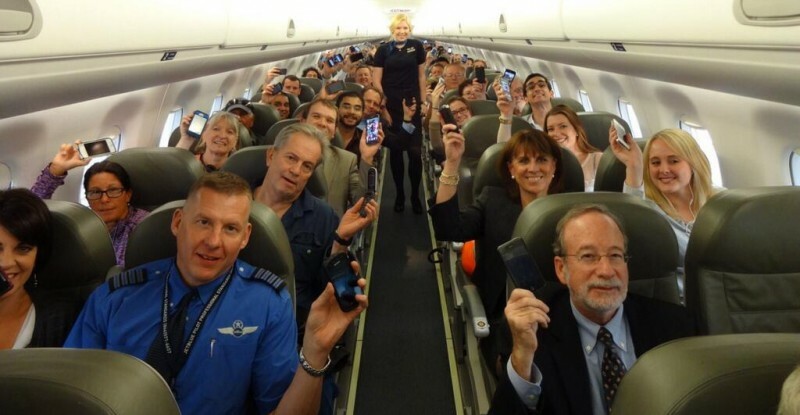 Below that altitude, crew require the full and undivided attention of passengers. We need you to be prepared. Remember, the stowage of loose items was required long before the iPad. The PED Aviation Rulemaking Committee (ARC) concluded most commercial airplanes can tolerate radio interference signals from PEDs. In a recent report, they recommended that the FAA provide airlines with new procedures to assess if their airplanes can tolerate radio interference from PEDs. Once an airline verifies the tolerance of its fleet, it can allow passengers to use handheld, lightweight electronic devices – such as tablets, e-readers, and smartphones – at all altitudes. In rare instances of low-visibility, the crew will instruct passengers to turn off their devices during landing. The group also recommended that heavier devices should be safely stowed under seats or in overhead bins during takeoff and landing. We need to know more about this “committee”. I think they’re the same people that sold Jack his magic beanstalk beans. On advice from highly regarded leprechauns, elves, hobbits and a talking unicorn, we’ve determined that the FAA investigation was completely legitimate and wasn’t influenced by airline bean counters. Even the most frequent of flyers aren't nearly as savvy as they think they are. I guess we’ll have to redefine what “Cabin Secure” means. What would have happened with Flight 1549 (Hudson River) or the more recent Asiana Flight 214 (SFO) had cabin crew had to deal with a plane load of passengers playing Angry Birds or Candy Crush with noise-cancelling headsets? How effective would the Captain PA have been if the passengers didn’t hear it? Despite briefings, safety cards and a very deliberate effort of all on board to prepare passengers for any kind of incident, passengers consistently get it completely wrong. Do we really need 400 unsecured PED devices turning into damaging projectiles? What happens when the devices come to rest as slippery makeshift skateboards in the aisles when passengers are making an attempt to egress? They’re secured during takeoff and landing for a reason. There’s a range of cabin related issues that are related to training – not to mention the additional cabin workload with the need to ensure that passenger usage is compliant. Time will tell where this debate and legislation is headed… just keep in mind that it’s not going to make your journey any safer. Jeremy has flown numerous turbine and jet types during his career with an emphasis on training. His speciality - with over 20 years of recognised expertise in PED usage and IFE - is cabin safety and human factors. Samsung’s VG Gear as an Aircraft IFE Option?